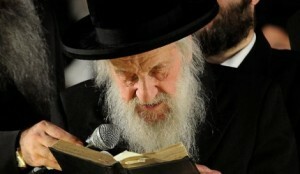 All are asked to daven for the welfare of Rav Shmuel Halevi Wosner, senior posek, author of the Shevet Halevi and rosh yeshiva of Yeshiva Chachmei Lublin in Bnei Brak, whose condition is said to be critical. Rav Wosner is hospitalized at Mayanei Hayeshuah Medical Center in Bnei Brak, where he is sedated and hooked up to a respirator. His family members are nearby, davening for his recovery. Rav Wosner is 101 years old. A letter signed by Rav Aharon Leib Shteinman, Rav Chaim Kanievsky, Rav Nissim Karelitz and Rav Gershon Edelstein calls on Yidden all over the globe to daven for Rav Wosner. All are asked to daven for Rav Shmuel Haleivi ben Rochel. do we add “halevi” when mentioning his name?